A feature by Kevin Cooper, Vice President of Public Policy for The Greater Sarasota Chamber of Commerce. 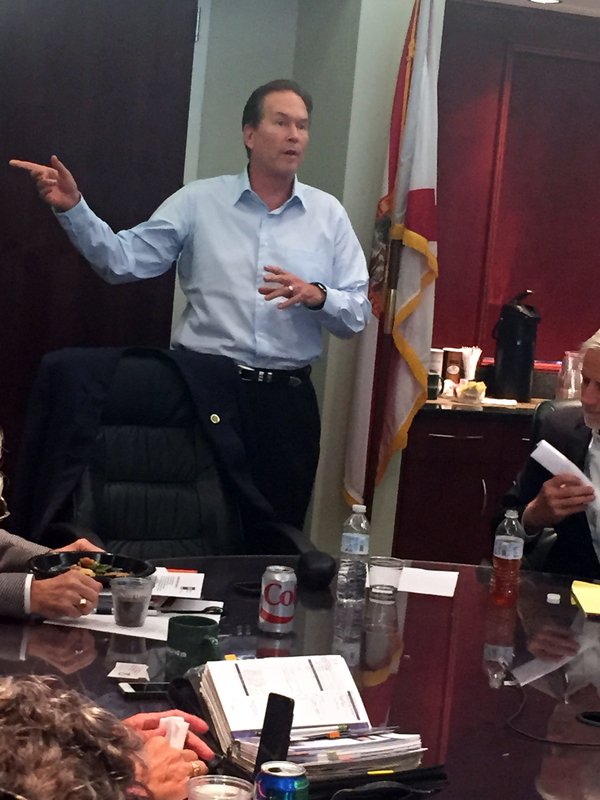 On a recent afternoon in September, over 40 key Chamber members and community leaders participated in a luncheon and roundtable discussion with United States Congressman Vern Buchanan. Not only does Buchanan represent the area’s interests in Washington, D.C., but he is a Longboat Key resident and former Chairman of the Board for The Chamber. Not long after seeing the President sign his Veterans Identification Card Act into law, Buchanan was in the area to share his thoughts and focus for the near future. Earlier in the day, Buchanan met with a number of tax professions who represent corporations of all sizes. The Congressman shared with The Chamber group how he would like to see the tax code significantly simplified. Specifically, the length and complexity of conformity, he contended, is both challenging and costly for taxpayers. Buchanan also linked tax code concerns to budget deficits. As co-chair of the Florida congressional delegation, Buchanan also stressed the importance of compromise and the need for increased bi-partisan efforts in the nation’s capital. With Florida being the country’s third largest delegation to Congress, Buchanan hopes members can continue to serve as an example of how to work together across the aisle in D.C. He highlighted the strong relationships amongst members of the Florida delegation who might otherwise stand across opposite political lines. Some of the other Florida-specific items highlighted during the luncheon included citrus greening and flood insurance. Additional nationwide topics included veteran healthcare and economic competitiveness. 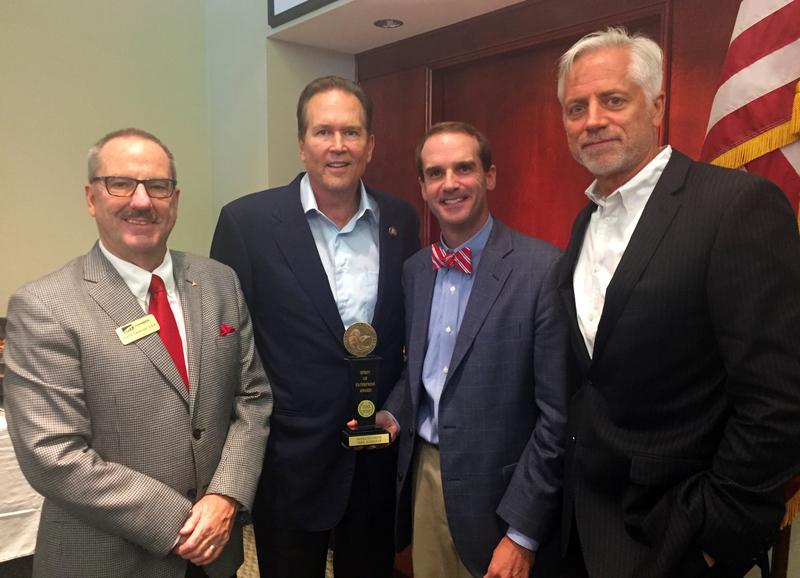 During the event, Congressman Buchanan was also recognized by the U.S. Chamber of Commerce with a Spirit of Enterprise Award by Moore Hallmark, Executive Director of the Southwest Region. The U.S. Chamber’s prestigious Spirit of Enterprise Award is given annually to members of Congress based on their votes on critical business legislation. About Congressman Vern Buchanan: U.S. Rep. Vern Buchanan is co-chair of the bipartisan 29-member Florida congressional delegation and Florida’s only member of Congress to serve on the powerful House Ways and Means Committee, which has jurisdiction over tax policy, international trade, and health care. Buchanan is also a member of the House Budget Committee. In his fifth term, Buchanan is an outspoken advocate of reforming the U.S. tax code to make it simpler and fairer. He serves on the Trade and Health subcommittees on Ways and Means. Tagged Chamber, Chamber of Commerce, Congress, Congressman, Florida, Florida Representative, Kevin Cooper, representative, Sarasota, Spirit of Enterprise, US, US Chamber of Commerce, Vern Buchanan, Veterans Identification Card Act, Washington D.C.
Reblogged this on Derek Byrd.